Following up my last post of "The Story of Indiana Jones and the Temple of Doom", today I present the Marvel comics adaptations for both "Raiders of The Lost Ark" and "Indiana Jones and The Temple of Doom." When the films came out, Marvel put out their adaptations on the news stands. Each film came to the colorful pages of Marvel in both a 4 part edition and a Super Special edition featuring the whole story. The Super Special Editions were considerably larger than a normal comic book and were much cooler to own. Not only that, you didn't have to spend as much money to get the complete story. I share with you both of those Super Special Edition Movie Adaptations. Here is "Radiers of The Lost Ark" and "Indiana Jones and The Temple of Doom" in their comic incarnation! BTW, I will never refer to "Raiders" as "Indiana Jones and The Raiders of The Lost Ark". It will always be "Raiders of The Lost Ark" to me and I refuse to use the "new" title. Enjoy the comics! Way back in July of 2007, I posted "Raiders of The Lost Ark: The Movie On Record". What followed was a slew of requests for the other Indiana Jones story records. At the time I did not know that the other story records even existed. Thanks to the wonderful help of several of The World of Wonder's many fans, I was able to obtain not only the story record to "Temple of Doom" and "The Last Crusade" but one for "Kingdom of the Crystal Skull". 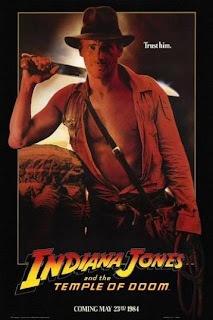 While you have to keep checking back for the last two Indy story albums, today I share the story album for "Indiana Jones and The Temple of Doom" with you. Interesting to note here is that while "Raiders" featured the film dialogue, music and sound effects, there was no narration to go along with what you were listening to. If you hadn't seen the movie, you would be lost. However, for the other story albums, the narrations are there. I post this now because I recently introduced these to my own son who loves them! We listened to both "Raiders" and "Temple of Doom" yesterday and he thought they were the best! And he's only 7 months old! Here for you now is "The Story of Indiana Jones and The Temple of Doom". Even though if comes from a two sided album, the file is one long track. Enjoy! Here is "Raiders of The Lost Ark:The Movie on Record" from my post back in 2007! Enjoy! Here, as promised , is my second Classic Television Episode of the Month. In case you haven't heard yet, Robert Culp passed away today. He was 79 and will be sorely missed. While he is best known for his ground-breaking work on I-SPY, I will always remember him as the great Bill Maxwell on The Greatest American Hero. The people in my generation have no idea who you are talking about when you mention the name Nancy Walker. However, if you say "The Bounty Lady from the 70s" we all know that you are talking about Rosie. 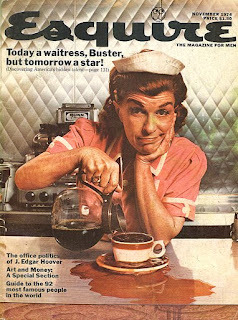 Long before she was the spokesperson for Bounty, appearing as Rosie, the Diner waitress, Nancy Walker was a bonafide star. Though she was only four feet, ten inches tall and difficult to cast, she managed to land a role on Broadway in the 1941 show, Best Foot Forward. The role provided Walker with her film debut when a film version, starring Lucille Ball, was filmed in 1943. A subsequent appearance was in the MGM musical, Broadway Rhythm, in which she had a featured musical number, "Milkman, Keep Those Bottles Quiet". She continued acting throughout the 1940s and 1950s and her appearances in musicals led to record releases. Soon after that came television guest appearances and recurring roles, providing her with steady work. Her career spanned five decades, and included comedies, dramas and television variety shows such as The Garry Moore Show and The Carol Burnett Show. In 1970, she secured a recurring role as Emily the housekeeper in the hit situation comedy Family Affair starring Brian Keith. Also that year, Walker made her first appearance playing Ida Morgenstern, the mother of Valerie Harper's Rhoda Morgenstern during the first season of The Mary Tyler Moore Show. In 1974, when the MTM spinoff series, "Rhoda" premiered, Walker joined the cast as a regular. She was also a regular on the successful Rock Hudson detective series McMillan and Wife, playing Mildred. These two roles brought her seven Emmy Award nominations. She also tried her hand at directing which included episodes of The Mary Tyler Moore Show, Rhoda and Alice. In fact, she is the director responsible for the 1980 pseudo-autobiographical musical "Can't Stop the Music", which tells the tale of The Village People. The film was a box office failure but has since become a cult favorite. This was the only theatrical film ever directed by Walker. One of Walker's last major film roles was as the deaf maid, Yetta, in the 1976 all-star comedy spoof Murder by Death. She continued to remain active in show business until her death, playing Rosie in the Bounty commericals. She helped make the product's slogan, "The Quicker Picker Upper", a common catchphrase. Today, we pay tribute to that loveable little lady with her 1959 release, "I Hate Men". Backed by Sid Bass and his orchestra, it features such show tunes as "I'm Going to Wash That Man Right Out of My Hair" and "You Irritate Me So". I listened to this last week and it put a smile on my face. I hope it does the same to you. Enjoy! The Vivino family is a big name in show business. Guitarist, Jimmy Vivino, is an amazing guitar player who has helmed the Max Weinberg 7 since the beginning of Conan O'Brien's late night career. His brother Jerry is the saxophonist of the group. Both of the brothers have played with some serious names over the years and have done tons of sessions.You probably have recordings with them on it and don't even know it. I once heard that the Vivino brothers "owned" the New York music scene. Besides Jimmy and Jerry, there is another brother in show business. He is also a musician as well as an accomplished actor. His most famous film role was that of disc jockey, Eddie Kirk in "Good Morning Vietnam". However, millions of faithful television viewers in the tri-state area of New York, New Jersey and Connecticut, he is better known for his starring role in the cult hit, "The Uncle Floyd Show". 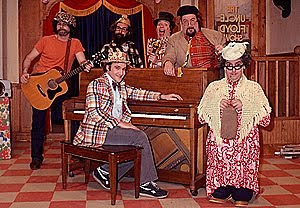 For those of you who don't know, The Uncle Floyd Show aired in the New Jersey and New York market from 1974 to 1998. It was touted as a children's show but it soon became apparent that it was more of a parody of a children's show. Much of the humor had a twist aimed at adults in the style of Soupy Sales and Pee Wee Herman. The show featured slapstick comedy, puppetry, some audience participation, and piano music. Floyd's puppet sidekick was named Oogie. The first cast members were Pat Cupo and Bob D. Caterino. Later members were Scott Gordon , Craig "Mugsy" Calam, "Netto", Jim Monaco, "Looney" Skip Rooney, Charlie Stoddard and Artie Delmar. I remember coming across this odd show at my grandparents house. At the time, they had cable TV and we did not. Whenever I was at their house (which was a lot) I waited patiently for the show to come on and then would watch in awe. I was pretty sure I was watching a television revolution. My father and grandfather watched it with a few times and were laughing at a lot of the stuff I was but also at other parts that I wasn't sure why. One of my favorite parts of the show was when the cast would start breaking up and laughing at the bits that they were doing. Add to this, a roster of celebrity guests and you have the recipe for classic television viewing. There is a video compilation that was released on DVD a few years back that I have been meaning to purchase. Until then, I will have to settle for these video files from The Uncle Floyd Show!!! The Best Of The World of Wonder: Don't Call Me Shirley! The great Peter Graves passed away yesterday. He was known the world over as the star of Mission Impossible but to my generation he was best known as Clarence Ouver, the pilot at the helm of Airplane!. As a tribute, I am reposting the story record of that great film. Rest In Peace, Mr. Graves. I present to you now, one of my all time favorite records! 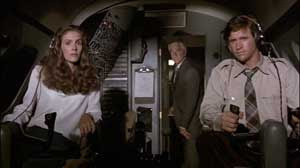 This is the soundtrack from the hit film, "Airplane!". Although it states that it is the soundtrack, it is not all music. Instead it is the actual soundtrack from the film. All of the dialogue and sound effects and music as if you were listening to the movie on a record! Basically that is what you're doing! 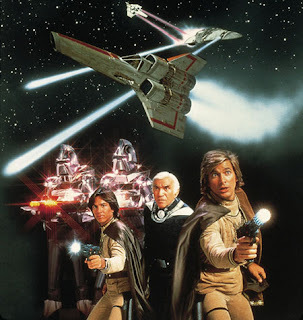 In the tradition of The Story of Star Wars, The Raiders of The Lost Ark Movie on Record and The Saga of Battlestar Galactica, I present to you "Airplane!" for your enjoyment! One last little note, as with the Hollywood Squares album I posted not too long ago, I would play various tracks from this in between songs on my college radio show! Enjoy! Seeing as how my buddy, Micky Dolenz, celebrated a birthday this past Monday, I thought it only fitting that I post the classic Toni Basil single, "Mickey". If you were breathing in the 80s then you already know all there is to know about this song. It skyrocketed Toni Basil to superstardom. However, Basil has been around since the 60s. 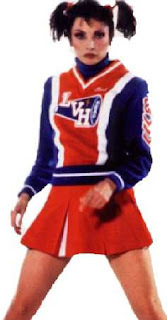 In fact, she was the choreographer and even appears performing a dance in the classic Monkees film, "HEAD". She was part of several famous street dance troupes in the seventies and in the eighties she tried her hand at singing. Her only #1 hit comes from her album, "Word Of Mouth". She continues to dance and choreograph to this day. Here is Toni Basil with her classic slice of 80s pop culture. Enjoy! The Best of The World of Wonder: Sing It Oli-ver! 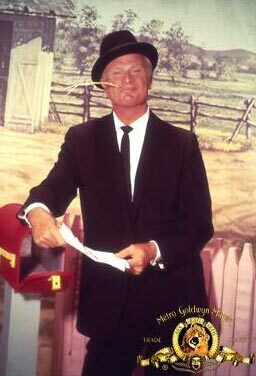 Although usually lumped in with other so-called "Golden Throats" like William Shatner and Leonard Nimoy, the late Eddie Albert had an extensive musical theatre background, including the original Broadway production of The Boys From Syracuse and taking over from Robert Preston in The Music Man. Still, it seems slightly incongruous that the star of Green Acres would get hip with the young crowd by covering Bob Dylan (Don't Think Twice It's Alright and, of course, Blowin' in the Wind), Simon and Garfunkel (Homeward Bound) and Gordon Lightfoot (For Lovin' Me) in his familiar avuncular manner. Just to be on the safe side, they include a new version of the Green Acres theme, lest anyone be disappointed. Of course the album I'm talking about is 1966's "The Eddie Albert Album". I was lucky enough to find a mint, unopened copy of this at an antique store for the amazing price of $1.00! I share my find with you now! In case you haven't heard, MTV took the "Music Television" out of their name last week. It makes what most of the world has known for years official: MTV is no longer a music channel. It's sad and very depressing. When MTV first hit the airwaves, it was a revolution and a phenomenon. It was very similar to the first wave of Rock and Roll back in the 50s. Kids loved it and parents hated it. It gave rise to a new form of musician and started a whole new era of music. Then, somewhere along the way, it became home to a bunch of really sophomoric programs that had nothing to do with music. Shows like The Real World and Made and the one where the parents fight their kid's boyfriend/girlfriend and try to come up with a better mate. I mean, seriously, what low level of intelligence are the folks at MTV looking for as their demographic. It's sad. I am a member of what was once called "The MTV Generation". Today's youth and all future generations have no clue just how great MTV once was. MTV has become the rebel that became part of the establishment when the sound of money clinked in their ear. As a memorial to the once great channel, here is the first 10 minutes of MTV. The first ten minutes of a broadcasting revolution. I wish it weren't so, but we will never see the like of this again. Today is my good friend, Micky Dolenz's birthday. He turns 65 today and is still going strong. As you read this, he is playing the role of Wilbur Turnblatt in the West End production of Hairspray in London, England. After that, he comes home to the US and this summer I will have the utmost privilege of playing a few gigs with him. To celebrate his birthday, I have asked The Three Stooges to personally wish him a Happy Birthday! Actually, it's just a coincidence. Back in 1961, in what has been touted as a unique marketing adventure, the Three Stooges recorded this birthday record in 238 different versions - one for each unique named child. So, you could purchase a 45-sized, 33 1/3-play record of the Three Stooges singing "Happy Birthday to You", personalized with your name. Sales were reported to be very slow, and with so many versions produced, stocking all of them was problematic. Production stopped soon thereafter. I was fortunate enough to find one of these in my travels for a measly $1.00. I share it with you now! As a bonus I've included the promo poster from the original release and an extra bonus Birthday song from the Stooges. 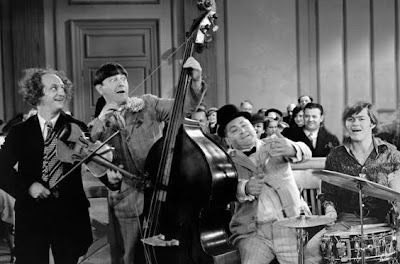 Here is The Three Stooges with "Happy Birthday To Mickey". (yes I know Micky Dolenz spells his name without an e but what are you gonna do?!) Enjoy! Nowadays, when you mention Battlestar Galactica, the conversation always turns to the Sci-Fi Channel's series starring Edward James Olmos. As much as I loved the new show (although, in my opinion, it went way downhill after the second season) the original will always hold a special place in my heart. Back in 1978, when it first aired, MCA Records released an album featuring an edited version of the soundtrack to the movie that included dialougue and sound effects. This was a popular fad at the time. This was pre-VHS and DVD so the only way to have something in your personal collection was either a super 8 home movie or a record. (They did it with Star Wars as well, which I posted here a while back!) Here for you now, is The Saga Of Battlestar Galactica. Enjoy! 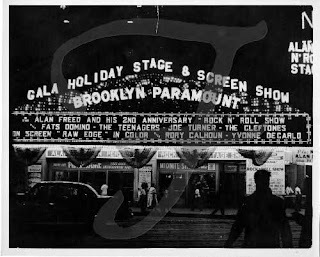 We've talked about Alan Freed and his Camel Rock'n'Roll Dance Party before and have even featured several of those shows here at the World of Wonder. What initially sparked my interest in the R'n'R Dance Party was a record that my father had when I was a kid. (A record that has since disappeared. I have no clue where it went but was glad to find a copy of it in my travels to replace the missing gem!) The record was put out on the Radiola label back in 1978. It was called "Rock and Roll Radio" and featured Freed introducing great hits from the big names of 1956. I had always assumed that these were two complete shows from the CRRDP and never questioned it any further. Upon further inspection and research we find that was not the case. In fact, the origins of these two shows on the record were a topic of discussion amongst fans of the show for many years. The man responsible for the release of this album was J. David Goldin, owner of the Radiola label. Goldin said he had received the recordings of 23 issues of the Camel Rock'n'Roll Dance Party from a friend in Frankfurt who had access to the Armed Forces Radio archives there. However, the recordings already had been edited a lot. Among other things, the AFR had cut out Camel's (the show sponsor) name everywhere, which must have been in every second sentence Freed had said. The Radiola album Rock'n'Roll Radio (Radiola MR-1087) was a collection of the songs Goldin liked best. So, in a nutshell, they are not complete broadcasts but are a compilation of several shows edited together to make it seem like complete shows. Either way, the album is great! The recordings have amazing sound quality for tapes of shows that were, at the time, twenty years old. With such greats as Frankie Lyman, Bill Haley, Clyde McPhatter, Etta James, the Chordettes, Ivory Joe Hutton, Gene Vincent and the great, Chuck Berry. Also, be on the listen for the presentation of an award to Count Basie from Cashbox magazine as "Best Rock 'N' Roll Band in the Country," based on a nationwide poll of jukebox operators. Here is that great Radiola LP. Here is "Rock 'N' Roll Radio". Enjoy! When Spike Jones left RCA Victor and moved to Liberty Records, he was determined to stick it to his former label. At the time, RCA was issuing a series of records entitled, "50 Years of Music America Loves Best". The albums were extremely popular and Jones attacked it from all angles going so far as to have the cover show a painting of himself on all fours in front of a gramophone, just like RCA's Nipper. The title of Jones' album changed the name from "50 Years of Music America Loves Best" to "60 Years of Music America Hates Best". It was recorded by Spike's later orchestra, "The Band That Plays For Fun," a tamed-down version of the City Slickers. Everything gets the Jones satirical needle injected into it here, from rock & roll and teenagers ("Pimples and Braces," "Kookie, Kookie, Lend Me Your Comb") to novelty tunes ("Mairzy Doats," "Three Little Fishes," "Hut Hut Song") to polka bands ("Strip Polka," "Melody of Love"). An interesting album from the last days of the bandleader's career. Certainly not his best work, but by no means his worst. 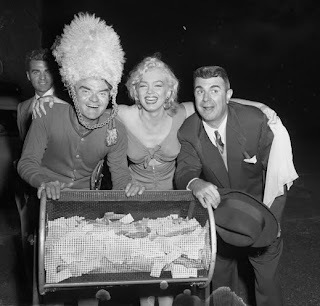 Here is Spike Jones with "60 Years of Music America Hates Best". Enjoy! This is the Castle FIlms digest version of Mexican Hayride. My grandfather had this one and he used to show it a lot! His was the silent version. This one has the sound! Enjoy!